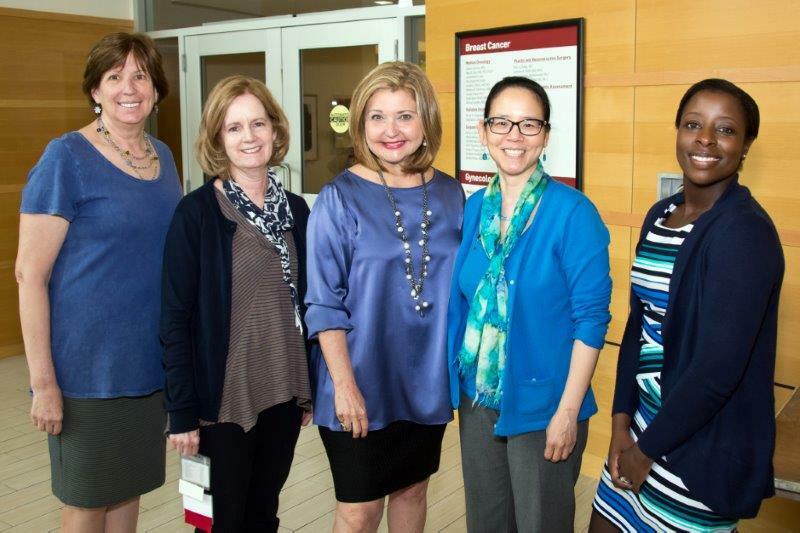 To mark National Women’s Health Week, Fox Chase Cancer Center brought together more than 75 patients, caregivers, and medical providers for Together Facing Gynecologic Cancer. It was a day of education, inspiration, and engagement. The program began with a brief stress-reduction exercise session before the group split up to attend breakout sessions and panels of experts and patients. The sessions covered survivorship, clinical trials, caregiving, and a range of other topics related to gynecological cancers. Gynecology nurse practitioner Sharon Schwartz, CRNP; gynecology chemotherapy nurse practitioner Kathy Smith, CRNP; gynecologic oncologist Cynthia Bergman, MD; and radiation oncologist Krisha Howell, MD, served as experts for the survivorship panel. They were joined by Sandy Bernstein, an endometrial cancer survivor; Karen Mason, an ovarian cancer survivor; and Keishau James, a cervical cancer survivor. Former CBS 3 Eyewitness News anchor Pat Ciarrocchi moderated the discussion, giving the three survivors an opportunity to share their stories and offer advice to the group. After sharing her story, Mason reminded the group that a cancer diagnosis can be stressful and overwhelming at times, and there’s no one right way to deal with these new emotions. Bernstein urged patients to rely on hobbies and familiar activities to help navigate complicated and overwhelming medical decisions. “Find something that will ground you and keep you feet on the floor while your head is spinning around,” she said. During the panel on clinical trials and rare tumors, Stephen Rubin, MD, chief of the division of gynecologic oncology; gynecologic oncologist Gina Mantia-Smaldone, MD; gynecologic oncologist Christina Chu, MD; medical oncologist Angela Jain, MD; and Lainie Martin, MD, chief of gynecologic medical oncology, explained the different types and phases of clinical trials. Patients asked questions about how to know if a clinical trial is the best treatment option and how to find the right one. During the caregiver workshop, Smith; social worker JoAnne Rufo, MSW; gynecologic nurse navigator Nancy Nicotera, RN; gynecologic nurse navigator Carol Cherry, RN; gynecologic nurse Janet Strainic, RN; and Director of Professional Development Susan Cobb, PhD, offered resources for caregivers. Ciarrocchi facilitated a spontaneous discussion between two caregivers in the audience, who discussed their concerns and emotions. Sessions on integrative medicine, nutrition, hereditary cancers, pain and palliative care, and mindfulness and stress management were also included in the program. There was also a vendor fair vendor fair featuring Fox Chase patient care services and offerings from a variety of companies and advocacy groups. Speaking on the survivorship panel, Bernstein reminded her fellow patients why events that unite people from all corners to fight cancer are important for both patients and caregivers.